Deb Gates has been a member of the JobGiraffe team since 1999 working as a recruiting and staffing consultant in our Vernon Hills office. She also is an active fundraiser for the National Multiple Sclerosis Society, and has recently been recognized for her good work in the Chicago Tribune’s suburban online publication (you may find the article about her here). We are very proud of her annual leadership and participation in fundraisers for MS research and would like to commemorate her here, as well as share a little bit of her story. Deb was diagnosed with MS back in February of 2004 while working with JobGiraffe (which was then known as Paige Personnel Services). Within just a few months of receiving her diagnosis she decided to become actively involved in fundraising for Walk MS, which supports the research of this disease (which, in short, interrupts the flow of information in one’s central nervous system) and affects roughly 2.3 million worldwide. She then made participating in Walk MS a yearly event, and recruited family and friends to participate with her. 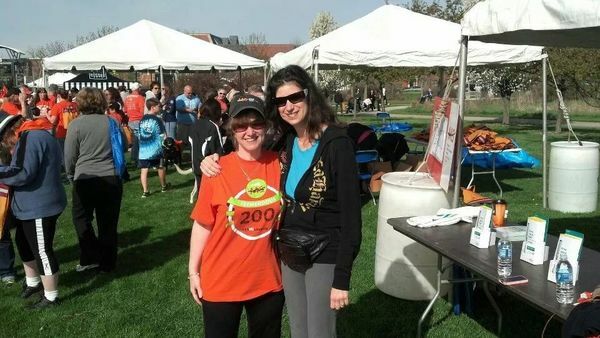 She just was involved in the most recent walk, which held on May 4th at Attea Middle School in Glenview. But the best part is that Deb didn’t stop there. In 2012, when Deb’s family wasn’t able to join her for Walk MS, she created and organized her own bowling fundraising event. How impressive is that!? That year they raised $3,000 for the National MS Society. However, this past year she outdid her self and her bowling fundraising event raised $3,500. Not only did Deb annually become involved in Walk MS but she has now orchestrated her own annual fun-centric bowling fundraisers that seem poised to raise more and more funds each year. Fundraising for research for MS is essential, as it is a disease that takes on numerous forms for different people and is a disease for which unfortunately there is no known cure. We are proud of Deb, how she has stayed positive and not let her diagnosis affect her daily life much, and how she immediately began to be involved in fundraising for research for a cure – and has continued to do so for a decade now. We are also proud that the Chicago Tribune online recognized her efforts! If you would like to know more about Walk MS or donate online just contact The Walk MS Team at 312.423.1156 or at walkmsillinois@nmss.org, or you may visit walkMSillinois.org.